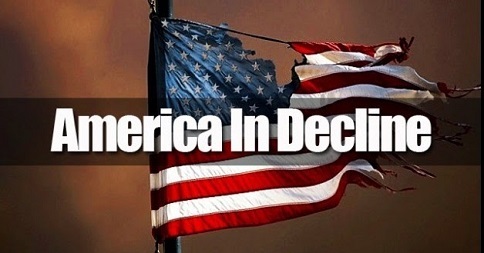 The country we live in, America, is an empire in decline. We are showing ALL of the signs that world powers in the past have shown. America is broke and its’ money debased (soon it will not be worth the paper it is printed on), its’ military is over extended. We have too many takers and not enough producers. We have lost our religious morality and values. We promote, celebrate and encourage that which was considered sexual perversion and degeneracy. We are being invaded by our own version of barbarians (Yes I do mean illegal aliens and 3rd world Muslims). We now mock patriotism. We are being taught to be ashamed of and despise our history. We are obsessed with sports, entertainers and material things (our version of Bread and Circuses). Our women hold in contempt marriage, family and the raising of children. Think of all the babies this country has murder via the genocide called abortion. We now call this kind of murder a “right”. Given the millions of abortions since it became “legal”, we have made Hitler look like an amateur next to this countries abortion body count. To make matters more revolting, tax payer supported Planned Parenthood, sells baby parts. Our men are becoming shallow beta males, too weak and flawed to qualify for military service. Think about the state of affairs when it is easier to get into the university of choice than it is to enlist in the military. We as a nation are in a nose dive. ALL world powers had a limited life span, we are approaching the end of that time span. The best thing I can say about Trump is that he is NOT Hillary the evil Clinton. Trump can NOT make America great again. The road to ruin is not going to be reversed. It seems that we the people are going to learn once again, that when you disarm a group of people, they become the targets of genocide. Yes it can happen here, and if the Lefties (democrats, socialists, progressives) get the gun CONFISCATION laws passed here, it is a 100% certainty that it WILL happen. They do hate you and want you dead. With that now said, I ask what are you doing to protect the United States Constitution and our God given liberties and freedoms? America, British Empire, Constitution, Democrats, Family, Freedom, Genocide, God, Liberties, Marriage, Morality, Patriotism, Progressives, Religious, Socialists, Values. Bookmark. That’s because we’ve allowed a political class to develop that depends on a large segment of our society being dependent on them in order to maintain their power. So many Americans have abandoned the rugged individualism that made this country great. In favor of the nanny state. And why is that? Why, because many Americans have kicked out God from America, others just don’t care and still, others just do what feels good, but they will never know what freedom truly is because they refuse to surrender to Jehovah God! That’s where true freedom is. Firstly I’m disappointed in the quality of your more resent articles, whether your passion or time has been stifled, the content just isn’t what it was. Calling America a Empire is surely miss guided. Unless you count all states as individual countries. An empire is a multi-ethnic or multinational state with political and/or military dominion of populations who are culturally and ethnically distinct from the imperial (ruling) ethnic group and its culture. This is in contrast to a federation, which is an extensive state voluntarily composed of autonomous states and peoples. An empire is a large polity which rules over territories outside of its original borders. You really don’t want the title of empire. It comes with negative connotations.thats why Briton changed theirs to a commonwealth after Germany tried to create one. Allowing member states to have referendums every genaration(25yrs) to vote out if they wish to do so.